This minimalist, magnetic case protects your iPhone without covering up its iconic design. What if you could protect your iPhone from those unfortunate fumbles and slips without actually having to cover up your iPhone? Designer Hendra Bong appreciates Apple's landmark device for the beauty of its design, and came up with a unique, minimalist case that shows it off rather than burying it. It's made from a proprietary impact-resistant polymer, and held securely in place by a powerful magnet. That magnet does not interfere with the phone's operation or battery life in any way, but it does integrate effortlessly with the included magnetic wall mount, which lets you see your online recipes while you cook, or watch the morning news while you get ready in the bathroom. 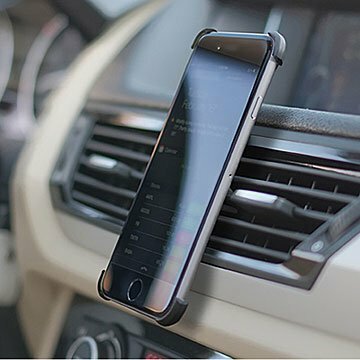 You can also combine it with the minimalist car mount, available separately, for hands-free convenience on the go. Made in Taiwan. Designer Hendra Bong holds a graduate degree in architecture from Harvard University and has over ten years of combined experience in architecture, urban planning, and, recently, industrial design. His contributions as an architect include projects such as the China World Trade Center in Beijing and Cathedral of Christ the Light in California. Magnetic wall mount is included with each phone case. Magnetic car mount sold separately. I ordered this and did not have a great experience. I appreciated Uncommon Goods customer service reaching out and offering me a new product, and I was willing to try again because I love the idea. The second time around, I would say that perhaps the one I got was a little off - this has worked great. With Washington state's new hands-free law, I am using it every day, and it is working very well. A good shortcut for those of us driving cars without hands free systems built in! I love this idea, and I had hoped to use this in my car and my kitchen. I changed out my case, and then mounted the wall magnet in my kitchen - it's still there. Problem is, the case is very loosely attached to the phone, and in just a couple days, the magnet at the back of the case fell out (somewhere - can't find it anywhere). This makes the item unusable. Also, the car attachment is set to grasp very narrow car heat/ac bands. My 2003 Honda Pilot has thicker bands across the heating and a/c and I broke 2 of them trying to get this thing to stay on them. Tried it in a new car, and it seemed to work okay - but be sure to check your car before purchasing.